In theory, owning a facial steamer would be great as it would allow you to have your own facial spa treatment at home. However, there are quite a few who feel somewhat intimated because they do not know how to use a facial steamer. If you are among those who are having second thoughts about spewing hot steam on your face, you can stop worrying now for we have got your back. In this article, we will teach you the proper way of using a facial steamer as well as share with you the benefits that it can offer. Are you ready to have clearer skin? Then keep on reading! Before we go over the steps on how to use a facial steamer, it is only right that we first talk about what facial steaming is. Believe it or not, this skincare regimen has been in existence for centuries. In fact, back then, it was the only known way to drastically make the skin look more healthy, glowy, and flushed. Facial steaming can also be referred to as face sauna because, after all, you are literally exposing your face to such high temperatures. This is done via the steam that is produced from hot water, which is an effective way to deep clean the face. When you do facial steaming, the water particles from the steam penetrate the skin. What this process does is not only unclog pores but also detoxify the skin from impurities. As a result, the extraction of blackheads and pimples will be much easier. Not only that but whatever you apply on your skin after doing facial steam will undoubtedly be absorbed better because the pores are already cleaned out. Also, the skin is prepared to take on more product. So how can you do facial steam? Before, the traditional way of doing it is to boil some water and put it on a basin. Then, you directly place your face on top of the basin while holding a towel over your head to seal in the steam. As you may have imagined, doing this presents risks of accidental burns. Good thing, we are now living in modern times where you do not have to do the same. In fact, you can just buy a facial steamer, and it will do all the work for you. Clogged pores are the primary source of acne and other skin irritations. The skin is, obviously, covered with pores. What happens is that it gets clogged due to exposure to dirt, sweat, and even air. The truth is, you really cannot completely clean out your pores with just cleansing your face and through exfoliation. They need another step in order to unclog the buildup from the pores, which is where steaming comes in. Steaming is a very effective way to clean out pores. While you are steaming your face, the build-up from your pores is pulled to the surface. This is also the reason why facial care centers tend to do facial steam prior to extraction because it makes extracting easier. When you do facial steam, it does not only remove impurities from the skin, but it can also increase the blood circulation in your face. In turn, this stimulates the production of collagen. Now, we all know that collagen makes the skin look plumper, which then paves the way for younger looking skin. At the same time, exfoliation is also done, which will reveal fresher and brighter skin. This has a lot to do with the proper absorption of skincare products after facial steaming. Your skin is already prepared to take in all the nutrients of your skincare products because there is no more build-up of dead skin cells. Therefore, for those who are suffering from acne, your acne products will be absorbed properly and breakouts will be prevented if you do facial steams regularly. This is such a relaxing experience as some people tend to put aromatherapy oils in the facial steamer. You can do an at-home facial spa and just take in the rejuvenating feeling of the steam. More than that, facial steaming can also help with migraines and headaches. Lastly, sweating for a bit can give you an energized mood. All in all, this treatment will lower your stress, and you’ll feel more relaxed and rejuvenated. This is definitely good news for those who are suffering from sinusitis and colds. This is pretty much the same as taking a hot shower that temporarily relieves your clogged nose. Only this time, the effect is more prolonged, and you will find that you can breathe more easily. You have to prepare your face first by washing it with a mild cleanser. At the same time, you should also do a bit of exfoliating with a gentle facial scrub. Fill the water tank of your facial steamer based on the instruction manual. You can choose to add an aromatherapy oil, but if you are solely using it to detoxify your skin, it is better to use water only. Put the water tank back to its compartment and power up the facial steamer. Wait for it to heat up. Depending on your unit, your waiting time can be from two to 10 minutes. You will know when it is ready when it starts to mist or release steam. Once the steam is released, do not immediately put your face towards it. Wait for at least two minutes before positioning your face before the steamer head. After waiting, place your face before the steamer head depending on the distance in your user’s manual. Steam your face for at least 10 to 20 minutes. Rinse your face and pat it dry with a towel or facial tissue. Follow up with a mask or your skincare routine. 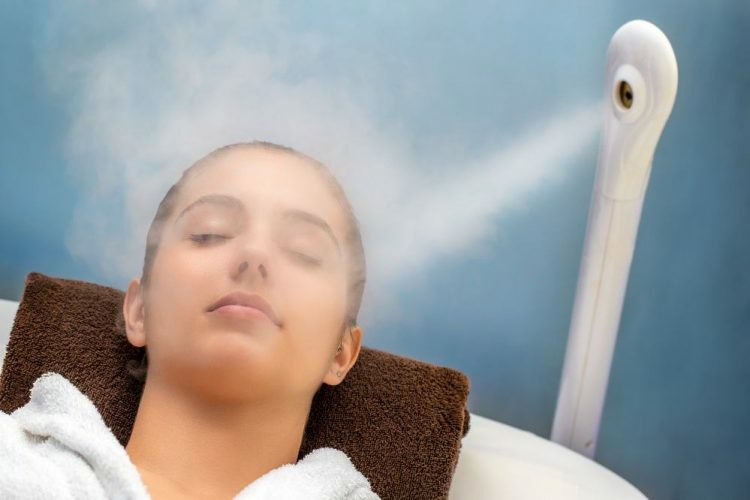 When facial steaming is done right, it can truly give you very favorable results. To do this correctly, you also have to familiarize yourself with the setting of your facial steamer so that you can use it to its full potential. More than that, always exercise caution. And, there you have it—the six easy steps to get clearer skin! Good luck!